What a difference a week makes! The Giants looked all but cooked going into their bye week but came back well rested to best their oldest foe in football. I did not think it was panic time going into the bye week but I also did not think we would beat the Green Bay Packers. The most impressive turn around on the team was sudden burst of sacks from the defensive line. Up to this point in this season they were majorly under performing. Mathias Kiwanuka seemed to rise from nowhere as he sacked Rodgers twice. I attended the Giants draft day in (holds back tears) Giants Stadium when we picked Kiwanuka; so anytime he does well my heart flutters. He really hasn’t been much of a presence on the defense until this game. Osi Umenyoria also seemed to get a spark back as he forced a fumble and was seen all across the field. In the backfield things remained solid. Corey Webster is constantly picked on by commentators and other teams as being a weak and easily exploited player but all he has done in his career is shut down people when it counts. This happened last night as he gave up an early touchdown only to have an interception soon after and then virtually shut down Jordy Nelson. Eli Manning had a sluggish start missing some easy passes but the running game compensated for it as Bradshaw had a huge gain on a screen. Andre Brown’s season was unfortunately ended after the first game where he was used as a perfect complement to Bradshaw. Hopefully this does not send the Offense into chaos for the rest of the season as Brown was the only power back on the roster. Nicks and Cruz looked great and as reliable as ever as they both scored a touchdown and rookie wide receiver Reuben Randle added six to the teams total as well. 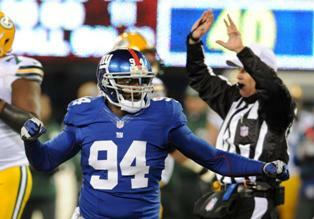 Looking ahead to next week the Giants are in for a challenge against the Washington Redskins. The last time they played it took a last minute touchdown to win the game. The Giants defense handled Griffin III well but one would assume he’s only gotten better in the weeks since the game. The Redskins also now look like the second best team in the division; so this game will be extremely important if the Giants want to take the N.F.C. East. I’m curious how the running game will function without the youth and fire of Brown. Hopefully rookie running back David Wilson chooses this week to show off the speed and talent he is said to have. I really think this week will be an entertaining and evenly matched show down between the two best teams in the division. 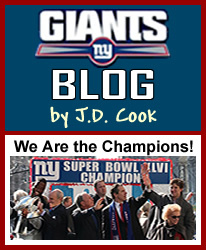 Here’s to hoping the Giants prove me wrong and wreck the Redskins who traditionally beat the Giants later in the season. Does anyone remember that game where Eli tied a record for incompletions in a game? That was horrible. I don’t want to see that again.